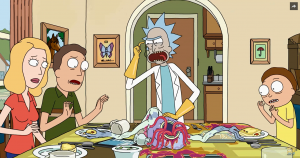 Rick & Morty is the popular animated series from Adult Swim in which we follow brilliant scientist Rick, his mildmannered grandson Morty and the rest of the Smith-family. 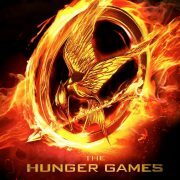 You know the show! If you don’t, you should binge it as soon as possible. 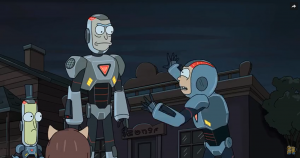 Rick’s portalgun is the main catalyst for many wacky adventures, filled with popculture references and zany characters. SPOILERALERT! 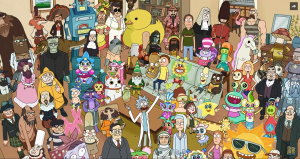 One of those characters is the bananalike Mr. Poopybutthole from season 2 episode 4: Total Rickall. The theory I’m going to discuss, and hopefully prove, involves his existence. In this episode Uncle Steve is at the dinnertable with the Smiths. 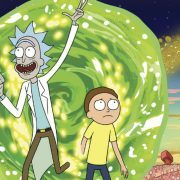 Rick is seen dumping limegreen stones with pink stuff on them in the garbage and subsequently shoots Uncle Steve in the head. The family is shocked to discover that Steve is actually an alien parasite. 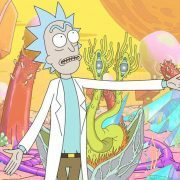 Rick explains that the telepathic parasites embed themselves in memories, then use those to multiply and take over whole planets. “Somebody probably dragged it in on the bottom of their shoe or a piece of alien fruit.” Rick says. “Somebody?” Summer asks, eyebrow raised. 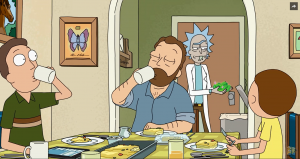 Suddenly Mr. Poopybutthole appears. Is he a parasite as well? The Smiths remember being stuck in an elevator after the Hulk-musical with MPB, only to be rescued by one Cousin Nicky from Jersey. (“I’m walking here!”) Character after character emerges, until the livingroom looks like a Where’s Waldo-page. Rick even breaks the fourth wall to point this out. So what’s the theory here? 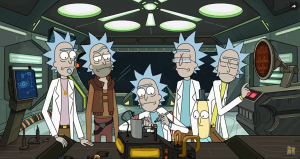 The theory is that we’re not in ‘our’ Rick C-137’s reality in two episodes. 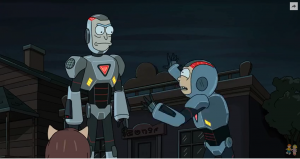 We’re watching a different set of Rick and Morty’s! We’re watching a reality in which MPB dóes exist. Okay, Wordy, what’s the proof? Now take a look at the form. With ‘dimension of your Jerry’ Rick writes N/A… Not applicable. 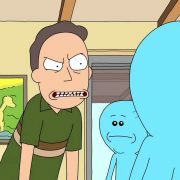 Does Rick even know which Jerry is with him? Apparently not. 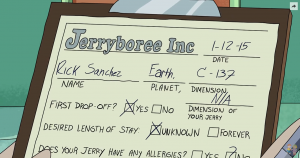 We do see ‘our’ Rick’s dimensionnumber however, so we know this is the Rick we’ve been with for more than a season. 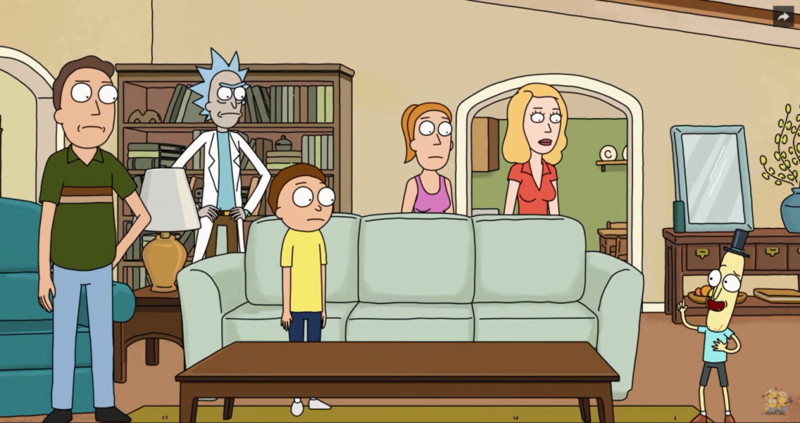 We watch Rick and Morty get into an actionpacked adventure with an alien hitman and a singing fart. 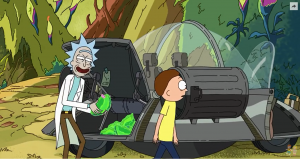 At the end of the episode Rick is seen putting green stones with pink things on them in his spaceship. 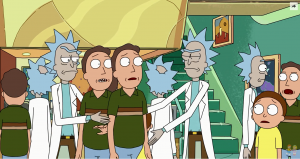 At Jerryboree Rick and Morty are retrieving their Jerry, when another set of Rick and Morty’s come and ask wether they have number 5126… Wait, what? Rick swaps the Jerries and the episode ends. 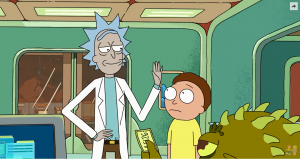 Wait… Weren’t we following the Rick and Morty with ticket 5126 this whole episode? Aparently not, this is the proof. But this changes everything, Wordy! It does. 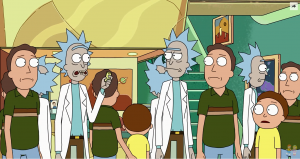 That means that this other-reality Rick is the one that brought the parasite on board with the green stones in Mortynight Run and that we’re watching hím instead of ‘our’ Rick C-137 in Total Rickall. This Rick míght have a longtime family friend like MPB, since all the signs point at his existance in this reality. But what about the happy memories of the parasites? Look at this screenshot of the memory with MPB. 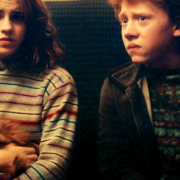 The family is stuck in an elevator, all looking pretty unhappy or annoyed. 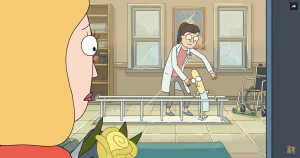 Morty has to pee, Summer already peed her pants and they’re, you know, stuck in a damn elevator. Not a happy memory! And guess what else… In the opening credits, MPB is there in every. single. shot. 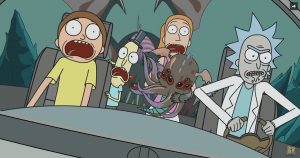 Do Rick, Morty, Summer and Mr. Poopybutthole look happy to you in the Cthulhu-shot? Even in shots from episodes we’ve already seen, like Look who’s purging now, where MPB definitely wasn’t there, he pops up. 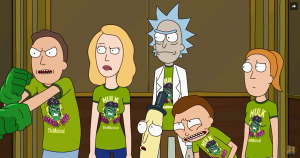 After all these clues, I think it’s pretty plausible that the Rick and Morty from Mortynight Run and Total Rickall are different ones and that, in their reality, Mr. Poopybutthole exists. What do you think? Wubba lubba dub dub! This is just one of the many, many theories about this amazing show. We will see wether this theory will pan out and how many other eastereggs we can spot in season three. To live is to risk it all. Otherwise you're just an inert chunk of randomly assembled molecules drifting wherever the universe blows you. Have you ever TRIED to relax?! It is a paradox!